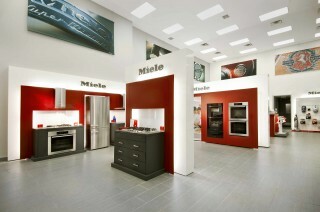 Miele Gallery offers high-end kitchen equipment — and working showrooms to test it out. Photo by Marc Fowler. It’s holiday baking season! Time to haul out the recipe books, don the frilly apron, and clear the counters for a full day of baking bliss. If this image doesn’t fill you with Christmas warmth, maybe it’s time to switch things up. While the Miele retail store frequently hosts demo nights in their fully-functional showrooms to help new and potential customers test out sophisticated kitchen appliances like convection ovens, next week they’re combining the charity of Christmas with the rich food and drink we all love. Miele Associate Chef Carola Price will offer baking tips, experts from Canadian and international wineries will be on hand with samples and pairing suggestions, and the built-in espresso machine will be prepped to keep the crowd pumped. Proceeds from the Holiday Baking Event on Saturday, December 10 go to support Refuse to Lose — Team Bryce, a local charity working to help six-year-old Bryce Jude with his leukemia treatment. If helping this little guy doesn’t give you that warm and fuzzy Christmas feeling, we don’t know what will! Tickets $60, includes lunch and a box of baked treats. Tickets are limited, call Miele Gallery at 613-695-9944 to reserve. The Look: Modern meets high-tech. Perfect for: The foodie who loves to entertain; the design geek who appreciates sleek storage. USP: The functional displays (and steam ovens) really sell this place. Plus, the team at Miele understands that some of this stuff might be new to customers, which make in-store events even more fun — and important.